Lambdas are one of the most prominent and useful elements of modern C++. They can significantly reduce the code and make it more expressive. The feature might look easy, but there are a lot of details that you need to know to master it. This free ebook will help you with that! I based those articles on a live-coding session on our Cracow C++ User Group. The presentation was lead by C++ Expert Tomasz Kamiński. The book you’ll see is a compilation of those two articles with extended descriptions, more examples and corrections. I used the Leanpub platform to prepare a beautiful looking book. 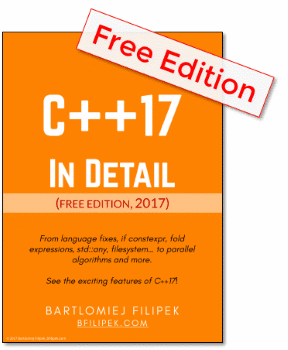 This short book wouldn’t be possible without valuable input from C++ Expert Tomasz Kamiński (see Tomek’s profile at Linkedin). Also, I’d like to thank Dawid Pilarski (panicsoftware.com/about-me) and JFT for helpful feedback on many details of lambdas. Last but not least, many updates to the book was possible because of the feedback and comments I got under the initial English articles. So I’d like to express gratitude to all readers of my blog! By using coding examples, the book shows the story of lambda expressions, we’ll start with C++03, and then we move into the latest C++ standards. C++11 - early days. You’ll learn about all the elements of a lambda expression and even some tricks. This is the longest chapter as we need to cover a lot of this. C++17 - more improvements, especially by handling this pointer and allowing constexpr. C++20 - in this section we’ll have a glimpse overview of the future. To get the book subscribe to my mailing list. You can unsubscribe at any time, even just after downloading the book, no pressure. 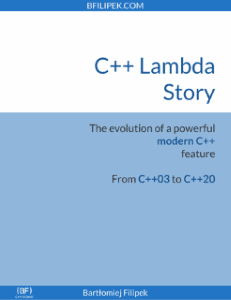 Subscribe & Download a free copy of C++ Lambda Story! You can also visit book's web page at Leanpub and buy other formats. If you decide to pay then this will support my work and allow to create even better C++ content. The book is 100% ready and I believe it will be very useful to you. I plan to make only smaller correction - especially to the language/grammar side. And I'm open to any suggestions and feedback from the readers!